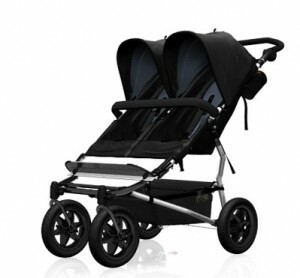 The Mountain Buggy Duet($599) is unique to any product on the market. 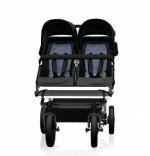 It is the only side by side stroller that is as narrow as a single but can carry two kids. Staying true to the Mountain Buggy name, this robust stroller is perfect for urban and suburban parents who want a buggy that will go anywhere they go while keeping their kids safe and comfortable. Because I had never tested a mountain buggy (some of our editors have) I was impressed with so many aspects of this stroller. It moves easily over any terrain and keeps up with me when I’m jogging. It is perfect for parents of 2 kids; whether you are having twins or adding a second child to the family. This stroller is one of my favorites and to test it we took it everywhere. It performed beautifully under any condition. From jogging around the neighborhood to navigating down gravel trails the Duet didn’t falter once. It is also narrow enough to go through the busy market and robust enough to go everywhere you do. In fact, I tried to find something that I didn’t like and could only come up with the fact that the red brake cover vibrates while I’m strolling creating a jittery noise – grasping at straws, I know. This was quickly fixed by wrapping it with tape. The stroller arrived on the morning of a trip out with my mom and sister. I was so excited I put it together on the front porch in my pajamas. It was that easy. The back wheels popped on in seconds, the front wheels need to be tightened in place with lock nuts and the canopies had to be attached to the sides of the frame, snapped into the middle of the stroller and then attached at the back. The Duet has a configuration for parents of a toddler/newborn, two toddlers, or newborn twins; they’ve thought of everything. You can even attach a freerider to the back if you have a pre-schooler that also needs to scoot along. From birth parents can remove one or both of the seats and attach infant car seats (staggered) or two carrycots (side by side). Removing the seat was surprisingly easy. All you need to do is remove the canopy, 10 snaps, undo 1 zipper and 1 strap. This can be done in 5 minutes or less. In North America, the Duet is only compatible with the Graco SnugRide(22) & SnugRide 35 but please check their ‘global travel systems compatibility chart’ if you live in another country as it works with other infant seats around the world. An adapter is needed – $43.99 for the Graco SnugRide(22) & SnugRide 35). 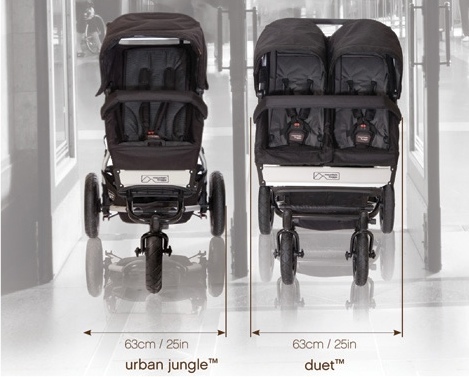 With both seats in the stroller, the Duet has a combined seat capacity of 79.2 lbs or almost 40lbs for each seat. 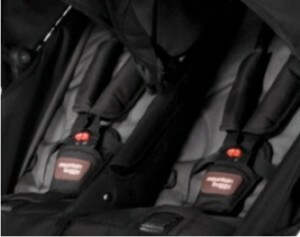 For your child’s comfort Mountain Buggy has included padded seats with a 5-point adjustable harness. To undo the harness parents must press 2 red buttons before the actuators. I like this because it means my boys can’t escape when I’m not looking. To adjust the height of the harness Mountain Buggy uses a nice twist and slide system that is very easy to use. The recline on each seat is individual and controlled by a strap at the back to give parents the option to have their child positioned at any height. Fully reclined both seats sit flat for a sleeping newborn. Inside the seats, there are also tethers to keep toys close. Like the seats, the Duet has separate canopies, which I love because it gives each one of my boys their own space. Each canopy opens up to cover a good portion of my kids and also has a mesh pop out for extra protection. The canopies are made with a very durable wire and won’t flip back during a windy day. Additionally, there are 2 plastic peek-a-boo windows with canvas covers that can be velcroed back for better visibility. As I mentioned above the push on the Duet is perfect. We took this everywhere but the beach and it pushed beautifully through all of our tests. Fully loaded, almost to its weight capacity, it moved easily over snow, grass, mud, uneven pavement and gravel roads. It was not designed to be a jogger but I did use it to jog with the boys and it did very well. To prevent it from rolling away there is a tether strap that parents can use to keep them connected to the stroller. Mountain Buggy uses 4 – 10″ inflatable tires to give your little ones a nice easy ride. The front wheels can be left to swivel for everyday use or locked forward for uneven terrain. To lock the stroller there is a single bar that connects both wheels. The Duet can be locked from either side and is ‘flip-flop’ friendly for vacationing or Summer trips out. On the handlebar Mountain Buggy uses a textured rubber that gives you a good grip. They have also made it so the handlebar adjusts to 7 positions, which is great for parents and caregivers of all heights. The Duet has Mountain Buggy’s unique fold, which is done at the footrest. It took me a few minutes to figure out the sequence, but once I mastered it, it made sense. Once initiated, the seats fold backward and the frame locks with a tether strap which is located on the handlebar. Nothing fancy but it works well. I really love the Mountain Buggy Duet. 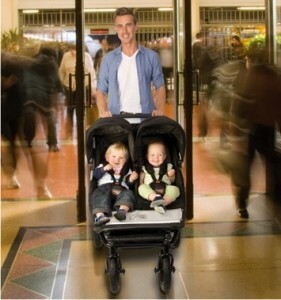 It is my go-to stroller for the mall, park or market. I even considered it for our recent trip to the Caribbean but decided against it at the last minute because I was worried it may get trashed if I gate checked it. I would have taken it if I had a travel bag because it was actually narrower than the umbrella side by side we ended up taking. When you fold it, the front wheels actually shift under the frame to reduce the length. 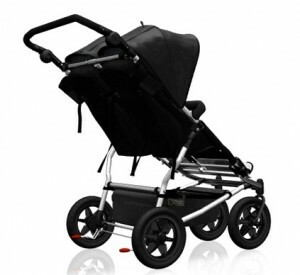 This is not a lightweight stroller but a good durable buggy that is built to last. I don’t often choose my gear by weight but by how compatible it is for my lifestyle and the Duet fits our busy lifestyle perfectly.